Hey everyone! I wanted to try making one of these wiper cards that I saw on Renee Van Stralen's blog. Beate put together a great tutorial on SCS on how to make these. Here's the link if you want to check it out. 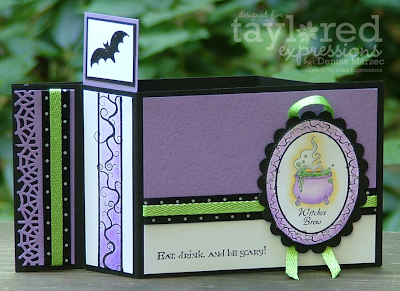 I used two stamp sets for my card, Spooky Expressions and Punchy Potions. The green sparkly ribbon is from the Halloween Key Ingredients, and the black scallop oval is up on 1/16" foam tape. 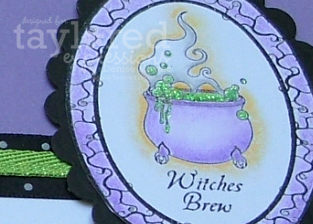 I added Eucalyptus Stickles to the witches brew. All images and the sentiment were stamped in black craft ink and heat embossed with clear embossing powder. Don't forget to add yourself on the newsletter distribution if you haven't already done so. The sign-up is over there in the sidebar right here on the SASI blog, or from the Taylored Expressions web site. How GORGEOUS Denise! What an AMAZING technique and flawless execution! This is GORGEOUS!! I've never made a wiper card!! Yours is FABULOUS!! I love every fantastic detail!! awesome wiper card, Denise! Glad I could inspire you! FUN Halloween card, Denise! I must try one of those wiper cards again real soon! Love the stickles!! This is FABULOUS!!!! I love the colors and the layout! That image is so cute, Great job!